AFCEA International is a non-profit organization comprised of members responsible for maintaining a forum in which government, military branches, and assorted industries can join forces to plan how to best use available technologies and stratagem. Since its creation in 1946, it has grown to over 30,000 members with 140 chapters and 1,605 corporate members. One of its chapters, AFCEA Bethesda, is based in Maryland and shares the mission of bridging the federal government and the private sector to allow for more partnerships on crucial IT innovations and applications. 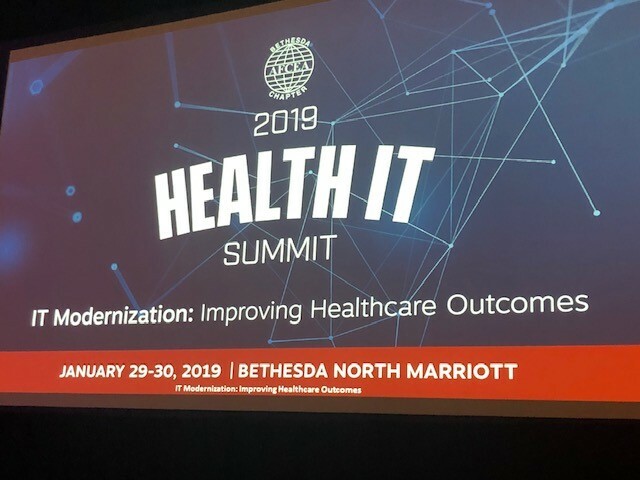 One of AFCEA Bethesda’s most recognizable events is the Annual Health IT Summit, this year being the 11th time they’ve hosted it. Boasting over 1,000 attendees composed of senior executives and IT specialists, the two-day conference allows for these professionals to both attend relevant keynote speeches and interact with others to share experiences and techniques that push the boundaries of what information and technology can do for healthcare as we currently know it while covering topics such as smart use of cloud, automation, health analytics, and the ever-popular cybersecurity and AI. The first day started with the ‘CXO Panel: Delivering More Value through Health IT’ where government leaders in Health IT service delivery could speak on their experiences with innovation, lessons learned and places of improvement needed with implementing new solutions. Panelists included Adriane Burton, Chief Information Officer of HRSA, and Andrea Norris, Chief Information Officer of NIH; Todd Simpson, Chief Product Officer for HHS; and Charles Worthington, the Chief Technical Officer for the VA. This was followed by four Breakout Sessions, the first of which covered cloud technology, called ‘VA: From Cloud First to Cloud Smart.’ Dr. Paul Tibbits from the VA Office of Information and Technology EHRM Integration moderated this one, focusing on the benefits of available cloud models (public, private, or hybrid) and integrating those with the aging legacy systems, but also handling cloud-related concerns, ranging from implementation and policy to security. The panel included Dr. Alan Constantian, VA Deputy Chief Information Officer and Account Manager; Dave Catanoso, the VA Director of Enterprise Cloud Solutions Office; Dr. Aaron Drew, VA Senior Enterprise Solutions Architect; and Joe Fourcade, a VA IT Specialist. The second Breakout Session, ‘The Security Imperative: Best Practices in Protecting Health Data,’ focused on how to best secure data now that it’s so readily available and the issue of enhancing user experience while still staying in the boundaries of security requirements. Servio Medina, Branch Chief, Cybersecurity Oversight, Governance and Strategy for DHA, moderated. Speakers included Rob Collins, Chief Information Security Officer for SSA, and Paul Cunningham, Chief Information Security Officer of the VA; Janet Vogel, acting HHS Chief Information Security Officer; Craig Taylor, acting Chief Information Officer and Chief Information Security Officer for FDA; and Conrad Bovell, CMS Director of Information Systems Security, Office of Financial Management. The day concluded with an evening program; the Dinner Panel called ‘Tomorrow’s Technology Delivering Improved Healthcare Outcomes’ included Jennifer Main, Chief Information Officer, Director and Chief Financial Officer for CMS, as a speaker. The second day featured four breakout sessions. CMS presented ‘Improving Services to Citizens and Providers’ on how IT offerings now can help fix healthcare, particularly how utilizing data more efficiently brings value with it. Three employees spoke: Julie Boughn, CMS Director for the Data and Systems Group, and Brent Weaver, CMS Director of Systems Implementation, along with Bobby Saxon, CMS Chief Technology Officer for the Center for Consumer Information and Insurance Oversight (CCIIO). The final breakout session, ‘AI and Machine Learning: Driving Intelligence into Automation,’ dove into the future of both IT and healthcare and how those two intermingle. Among futuristic technological advances lie AI, machine learning, and automation turning towards robots. Speakers discussed innovative uses and accepting these changes as they shift technology methodology in healthcare. Dr. Les Folio, Senior Research Physician at NIH; Christen Geiler, a Management Analyst for HHS, and Oki Mek, Chief Product Officer in the Division of Acquisition of HHS, were on the panel. GovDataHosting is proud to have the opportunity to sponsor this important annual event that improves the lives of citizens through optimizing healthcare by utilizing modern technologies. Choosing a cloud service provider that offers government Health IT specialized cloud infrastructure, cloud automation, experience and security at a lower cost is critical towards achieving the next generation of healthcare technology innovations. GovDataHosting's bundled cloud and security compliance services have been the subject of comprehensive HHS audits, which consistently verify proper implementation of required FISMA, HHS and HIPAA controls and stability of the company's cloud infrastructure. GovDataHosting is the only FedRAMP cloud IaaS vendor to offer HHS/HIPAA cloud compliant hosting exclusively for government agencies. Utilizing our full-service bundles comprised of pre-packaged cloud/security/disaster recovery/app support services agencies can expect cost savings while still increasing agility and lowering risk. We can help your agency protect its PII and PHI in the cloud. Contact us today to request a consultation or quote.